The Book Mine Set: Reader's Diary #1167- Mélanie Watt: Have I Got a Book for You! Reader's Diary #1167- Mélanie Watt: Have I Got a Book for You! I've only been out of full time teaching for about a year. Kept busy with other things, I haven't really had the time consider if I'd missed it or not. But man, did Mélanie Watt's Have I Got a Book for You! ever put me back in the headspace. The story of greasy salesman, Mr. Al Foxwood, who tries every marketing tactic in... the book, it reminded me of an old activity I used to do with my drama/improv class. I'd have a box of random objects, and small groups would have to pick blindly, then "pitch" the object to the class. It was typically a lot of fun and many approaches were similar-- if not as perfected-- as Foxwood's spiels to get you to buy not one, not two, but 742 copies. What a great book this would have been to introduce the idea. It's also a great book to teach about media awareness and advertising (though, some of the methods are a bit "old school" now), or voice. But rest assured, it doesn't have to have all the fun sucked out of it by over-eager teachers, the book would be fun completely on its own. The pictures too are delightful. Simple, but still clever. 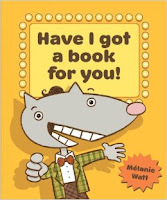 I especially loved how the book Foxwood is pushing is Have I Got a Book for You! which has that whole meta thing going on. I'm reminded of an old Smurfs record I used to have where a Smurf was holding up the album cover of a Smurf holding up an album of a Smurf holding up an album of a Smurf... and so on until it was too small to see. I thought it was the coolest.